The ASPects newsletter is sent to ASP members every month. 25-years of back issues are available in PDF format in the members’ archive, and is fully-searchable. This month, the first few articles are available to everyone as a free download. 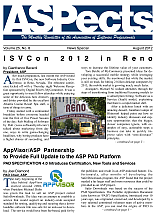 The full issue is available to ASP members. Paid Upgrades or Free Upgrades? The recent passionate discussion in the ASP newsgroups- “The million dollar question; To charge for updates or not?” inspired me to write this article.